LARUE, Texas — A number of residents in the LaRue, Texas area attended a school board meeting on Thursday to show support for a Christian flag that is flying outside of a public school after one of the most conspicuous professing atheist organizations lodged a complaint. According to local television station KLTV, James Young, the superintendent of the LaPoynor Independent School District, presented a letter from the Wisconsin-based Freedom From Religion Foundation (FFRF) during the meeting. In the correspondence, the organization contends that a Christian flag flying outside of LaPoynor High School violates the Establishment Clause of the U.S. Constitution, which reads, “Congress shall make no law respecting the Establishment of religion or prohibiting the free exercise thereof.” FFRF also states that it was improper for the school district to promote the national “See You at the Pole” student prayer day on its Facebook page. It appears that the flag was flown to coincide with the “See You at the Pole” event, but it is unclear whether students raised the flag or if school officials did so. It asked that the flag be removed. 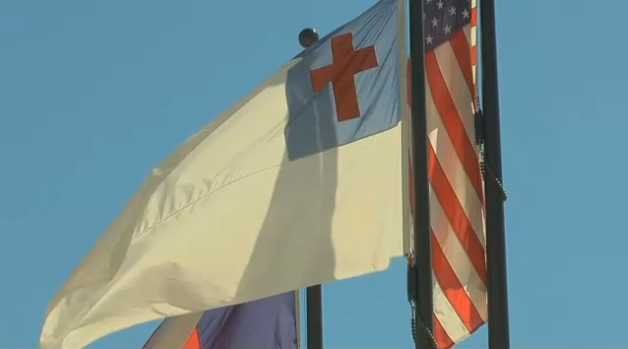 “The district must immediately remove the Christian flag from school grounds. In addition, the district must ensure that its staff members are not organizing, promoting or participating in religious events while acting in their official capacities…,” FFRF wrote. Young asked any opposed to the presence of the flag to stand, but none did. The district says that the flag will stay as it continues to deliberate the matter.